The illustrated Boker Knife is the Appaloosa Boker Trapper Knife that features clip and spey blades made of C75 carbon steel. The main blade has the Tree Brand etch. The Appaloosa Bone handle of this Boker Knife, 4 1/4" closed, has brass liners, nickel silver bolsters and an inlaid Heraldic Tree shield. 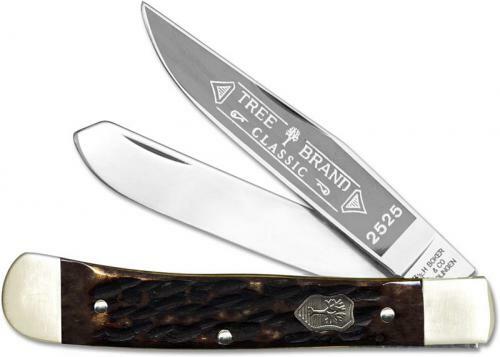 The Boker Trapper Knife with Appaloosa Bone handle is made in Germany.